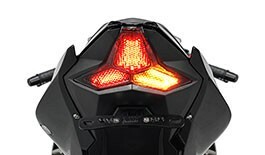 I love the TST Ninja 400 integrated tail light, and fender eliminator. Very Clean, Very easy to install. We installed it as soon as it was delivered, like kids on Christmas. High quality as always. It inspired us to update our Ninja 300, and bought the Ninja 300 tail light. Advantages: Nice clean lines. Exact fit. Easy install. Very bright. Great programmable light options. Easy to convert back to stock any time, not that any one would. Advantages: Tight and juicy OEM fitment with multiple light sequences. BRIGHT - I feel safer during my morning commute. Never trust a sleepy cager!